Everything new under the sun begins as an anomaly; but not everything thought to be new is genuinely new. Everything new and anomalous, if studied in the right way, can be explained; but it may take years of creative trial and error before we know what that “right way” is. The anomaly I’ve become particularly interested in recently is one known by some as “the Hum,” or “the Global Hum,” and it is one that I believe is somewhere on the trajectory of going from anomalous to explained. It’s also one that I believe has implications for how we think of the Anthropocene. The Hum refers to a low-frequency humming sound reported by many people around the world. According to some accounts, it is global, though concentrated in particular places more than others. According to others, it is local, imagined, or just a loose and overgeneralized name for a wide variety of possible phenomena. I’ve gotten particularly interested in The Hum because I’ve begun to notice it in various locations in and around Greensboro, Vermont, where I’ve just spent several weeks this summer. The Greensboro Hum — which I am the only person I know who has heard regularly — is an intermittent, foghorn-like drone at a frequency of about 60 Hz (cycles per second), which sounds like a low “B-natural” tone (slightly flattened) and which happens to be roughly the frequency of AC electrical currents in North America. The latter fact lends credibility to the hypothesis that this particular hum is related to some form of electrical current. But it’s non-directional, which means that it seems to come “from everywhere.” I hear it in various places, indoors and outdoors, and even with my ear plugged by a finger. (It seems slightly louder in my left ear.) And it is intermittent: generally most audible in the late evening, at night, and especially in the early morning, and turning “on” for periods ranging from less than a second to more than a minute, but usually for a few seconds at a time. When it is “on” and I listen closely, I can hear an oscillation or pulsation that appears to be regular and at a frequency of 4-5 cycles per second (with a little “skip” around the 4th cycle). This hum that I hear can also be modified or “played” to some extent by moving around, though this might simply indicate that it is combining with other, more immediate environmental sounds. Specifically, I can find places indoors where I can make it sound continuous, constant, and “wobbly,” with an audible pulse like one hears in a rumbling diesel engine (which is exactly how others often describe the hum). But this variability may well depend on how the “main” hum frequency combines with others generated by electrical appliances, such as fans, refrigerators, and the like, all of which appear to be able to shield it or cancel it out. So am I going crazy? Apparently, no. Or not unless many people around the world are as well. Numerous hypotheses have been proposed to account for the hum, including tinnitus or other kinds of “otoacoustic” emissions (which are generated internally by specific people’s hearing systems); cellular telephone transmissions; mechanical or industrial equipment of one kind or another; geophysical sources such as ocean waves, infragravity waves, or seismic processes; and a variety of government or military programs utilizing electromagnetic transmission signals, including LORAN, HAARP, and TACAMO (military communication signals used by the U. S. Navy). A few researchers have attempted to develop combination hypotheses, according to which VLF (very low frequency) or ELF (extremely low frequency) radio waves are generated by specific phenomena or devices and compounded by particular conditions, triggering sounds that are audible only to a certain, low frequency-sensitive portion of the human population. By their nature, VLF radio waves travel very large distances and, if heard as sound, would seem to come “from everywhere.” If VLF radio waves traverse the planet more and more, then they are likely also to combine in unusual ways — which would suggest that the Hum is increasing. “There is now a workable theory to explain how pulsed (oscillating) radio waves at lower frequencies can activate human nerve cells. For more than 50 years, increasing numbers of powerful VLF transmitters (mobile, stationary, and airborne), have been in operation. By line of sight, ground wave, sky wave, antipodal focusing, and geomagnetic coupling, the surface of planet Earth is riddled with zones of oscillating and high intensity VLF electromagnetic (EM) radiation. “A small proportion of people – I now estimate no more than four percent of the adult population – have auditory systems that are sensitive to lower frequencies and the type of biological activation described in the above paper. They may be able to detect the Hum in many places on Earth solely by interaction with VLF, while there may be another group of people who need some extant sub-audible low frequency sound or infrasound at certain frequencies in order to create sufficient auditory activation that would be interpreted as sound. Also, because the majority of Hum hearers are in the 40s or older, it is possible that certain age-related anatomical changes may initiate Hum hearing. “Sources of industrial infrasound, such as mining, hydro-electric projects, windmills, high pressure gas pipelines, and massive construction projects may or may not be prerequisite or aggravating factors in some settings. When there is strong but sub-audible infrasound such as from a large industrial site, it may take little VLF exposure in order to activate the auditory system. High levels of ambient noise during the day from traffic, industry, mechanical devices, and other people, often mask the Hum and explain why the Hum is stronger at night when society has quieted down somewhat, and why the Hum can become very loud in sound-reduced rooms. So what is the upshot of all this planetary humming for environmental thought and scholarship? The global hum (or hums), if it is (/they are) a new phenomenon — and evidence suggests it has increased over the last 50 years or so — is a new element of the global soundscape. Even if only a small proportion of the human population hears or is affected by it — and hearing something is not necessarily equivalent to being affected by it — there is little reason to believe that at least some other organisms won’t hear or perceive it as well. Those, like elephants, whales, rhinos, hippopotamuses, pigeons, and many others known to make use of infrasounds — sounds lower than the range of typical human hearing — would be particularly vulnerable to being affected by VLF radio waves and their effects. 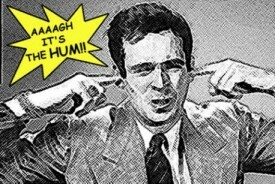 It’s not clear to me why, as MacPherson puts it, “industrial infrasound, such as mining, hydro-electric projects, windmills, high pressure gas pipelines, and massive construction projects” would be “prerequisite or aggravating factors” in hearing the Hum. But if this is the case, then all such factors have been increasing in the last 150 years or so. And even if they are not “prerequisite or aggravating factors,” the increase in artificially generated VLF radio waves around the planet — a fact that has hardly been studied — would suggest that human activities are having effects we can hardly comprehend on species around the world. In other words, welcome to the Anthropocene, generator of anomalies, novelties, and challenge. Have a good visit, and good luck with it. I live in Bristol and am sure that I’ve heard the Hum on occasion. Usually at night when I can also hear my raging tinnitus. There’s another much lower frequency that doesn’t seem to be explained by hearing damage. I’ve not heard it elsewhere, other than Bristol. Thanks, Philip, for your report. Much has been written about the Bristol Hum, so you are definitely not the only one who hears it. I have recently heard a similar low frequency (which I did not try to measure) in the Toronto area (specifically, central Mississauga, which is highly urbanized), and a lower frequency — about 40 Hz, with an audible harmonic at around 60 Hz — in Burlington, Vermont, where I live. I have also found that listening to this latter tone (from an online source) may be correlated with hearing it more frequently, though this would be difficult to confirm conclusively. All of this could lend support to the otoacoustic hypothesis, or a combination of otoacoustic and environmental, with still only a small percentage of the population (likely in a certain middle-upper age group) capable of hearing these sounds. Great post, Adrian. I wasn’t aware of this phenomenon before, but it stands to reason that the proliferation of technologies producing frequencies just around the cusp of what’s audible to humans would have such effects. And as you say, this is surely just the tip of the iceberg when you take into account the different perceptual systems (and parameters of perception and interaction) in other life forms. Finally, I think this is highly relevant for thinking about the infrastructural (and subphenomenal, including environmental) effects of media generally. Thanks again for posting! One of the sounds I have been hearing intermittently at night in my home in Burlington, Vermont, is a combination of tones that include an (approximately) very low E, B, and next octave E and B, or very roughly 19, 31, 40, and 60 Hz sounds. (These seem a little off from what they should be, since they should all be harmonics of each other, but perhaps the online tone generator I’m using is inaccurate). As with my previous reports, this sound appears to come from “all around,” so I can’t tell how close or distant its source might be. I could walk around the neighborhood to find out, but it’s too intermittent (and late in the night) right now for that to be a promising strategy. However, this has raised my inclination to believe that electrical systems might be the primary causes of at least some of the other hum phenomena that have been reported. As is well known, 60 Hz (between a B-flat and a B-natural on an A-440 tuned piano) is the fundamental frequency of AC power mains in North America, while 50 Hz (between a G and a G#) is for Europe and many other parts of the world (see here). So depending on where you live, if you do hear a hum and it’s in that frequency, it’s likely electrical in origin. I haven’t been able to trace the precise paths of resonance for this particular hum — the sound, as always, appears to come “from all around.” It does not sound like a simple AC hum coming from a single device; it’s not directional in that sense. My guess is that this may be, in part, because it is not a simple 60 Hz hum, but rather a lower hum with a strong 60 Hz harmonic frequency. But it’s controllable, in the sense that I can trigger it. Each time it is triggered, it lasts for something between a fraction of a second and a few seconds. My working theory is that, in this case at least, the tone is generated by some kind of mutual resonance between electrical devices and/or subaudible emissions or vibrations of some kind (and/or something within my inner ear). None of that eliminates the hypothesis of VLFs traveling very long distances — let’s call them “VLD VLFs” — such as military communication signals and the like. But it does lend support to the “non-VLD, electrically related VLF” hypothesis (i.e. very low frequencies that travel short to medium distances and are generated by or related to electrical devices; the latter seems a given because of the 60 Hz frequency). Humming started in my Essex, VT neighborhood around 3-4 weeks ago. It never stops but some days it is less loud than others. To be truthful it is driving me nuts. I bought Bose noise cancelling headphones to try to blot it out but this just makes matters worse as it seems to vastly reduce other frequencies but leaves the hum untouched. The hum is most notable in the house where I have to crank up the TV now to hear over it. Outside it is largely unnoticeable due to other sounds masking it. However, I put on my Bose noise cancelling headphones outside and the hum was there. I walked around my neighborhood in hopes it was a findable local phenomenon but it appeared to persist in the entire neighborhood covered by my short walk. Does anyone know of any engineers or state resources that could be consulted as to get to a bottom of a source? I mean some machinery had to be turned on 3-4 weeks ago. This has to have a source. I found this site while trying to discover the source of a humming noise that comes and goes. I live outside a small fishing village in the Yucatan, Mexico and there are no factories or industrials areas nearby. In fact, almost no traffic passes by my house, it is very rural. I first heard the humming about two years ago. Then it quit but recently began again. It varies in loudness from low to quite loud. If I were to compare the sound, it would be like the refrigerator is running louder than normal. This humming appears when the frig is unplugged so I know it isn’t that. It seems louder inside the house. When I go outside to try to find the source, it does not seem as loud. Very, very odd. I’ve come to favor the otoacoustic hypothesis for “my own” hum, as I can generally stop it temporarily by moving my jaw around. (Of course it starts up again right away and I can’t keep moving my jaw all night, so I just live with it, letting it come and go.) This means that it is probably generated internally, though the external environment clearly plays a role as well (not least because it must be quiet enough for the hum to be triggered, but also because of the role of certain triggering vibrations, described a few comments earlier). It sounds as if it’s coming from “all around,” but that’s no reason why the primary impetus for it could not be internal. After all, everything we hear (and that sounds as if it’s “out there” outside our bodies) is produced by the combination of what’s actually going on outside our bodies (sound waves and the like) and the neurochemical and physico-sensory apparatus of our body and brain structure. Without the latter (body/brain), we wouldn’t hear a thing. This means that the sense of spatial depth in our sound field (individually experienced soundscape) is also dependent on that apparatus. And if there’s something else internal to that apparatus that generates this low-frequency, tinnitus-like sound, then why couldn’t that also be experienced — audially felt — as “out there”? That’s my thinking now. I welcome comments from those who agree or disagree. The founder’s story is fascinating.